Parents, I know you will be excited for this one... It includes all of the perks of having a live hamster without the hassle and mess. 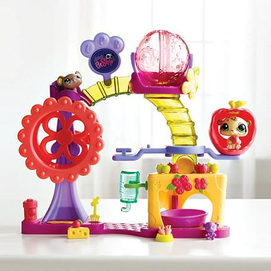 In the Littlest Pet Shop Hamster Playground, the hamsters can be placed inside the hamster ball for on-the-go exploration. Or, they can spin inside the 'exercise' wheel. After a busy day, your little one can tuck them in for a little 'nap' in their sleeping area until it's time to play again! Kids will be delighted with all of the colorful accessories they can share with their pets, including cheese, carrots and apples. The playset comes with two exclusive pets. Additional pets can be purchased seperately. For ages 4+ and retails for approx. $19.99. Available at most major toy retailers nationwide and on HasbroToyShop.com.